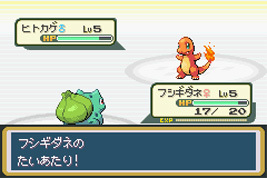 A remake of Pokémon: Red & Blue Version for the Game Boy Advance. The entire game has been redesigned from the ground up, with all-new graphics and sound, and added support for linking with Pokémon Ruby & Sapphire, including new Pokémon and attacks. The game also features a selection between a male and female character, and adds some new areas to explore after you clear the main game. The games are packaged with the GBA Wireless Adapter, allowing for wireless local link-up with other copies of the game.